Keto Essentials - Almond Flour - Headbanger's Kitchen - Keto All The Way! 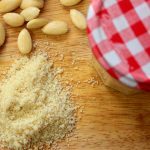 Almond flour or almond meal is an essential pantry staple on the ketogenic diet – it goes into everything from keto bread to low-carb pancakes – but it can also be expensive to buy. Here’s a way to make it easily and cheaply at home. You can use blanched or unbalanced almonds for this. There are so many recipes that call for almond flour on a keto diet. It’s especially great when you want to treat yourself to dishes that you miss from your regular carb eating. If you crave a pizza, there is our fathead pizza recipe, if you miss your sandwiches you can make our Keto bread or if you miss desserts then try the almond flour chocolate mug cake. The almond flour has even been use to make our Keto dosa. So it’s always good to make a big batch of almond flour and stock up. It’s essential that the almonds are dry when you grind them up. You can make them with the skin on as well if you like. Almond butter can also be made if you keep blitzing them for too long. Blanch the almonds in boiling water for 30-45 seconds or pour boiling water over them and let sit for a minute or two. Which food processor would you recommend? I use a Phillips one which I’m quite happy with. How do I make a cooker cake with almond flour? Use one of my cake recipes and use the cooker to make it. Can you also make some meal preps? Few things that can be prepped over the weekend to be cooked on weekdays? Most of my dishes can be prepped and cooked over the weekend and stored. Hey! How do you store it once you are done? Shall I put it in the fridge? If you live in a warm country then for sure but otherwise it might be able to sit out for some time and then will need to go in the fridge. Do you need to dry it in the oven before grinding it? You can do it without that but for best results it’s best that it’s as dry as possible.